This imagery of the sun captured by NASA’s Solar Dynamics Observatory from May 17-19, 2016, shows a giant dark area on the star’s upper half, known as a coronal hole. Coronal holes are low-density regions of the sun’s atmosphere, known as the corona. Because they contain little solar material, they have lower temperatures and thus appear much darker than their surroundings. Coronal holes are visible in certain types of extreme ultraviolet light, which is typically invisible to our eyes, but is colorized here in purple for easy viewing. These coronal holes are important to understanding the space environment around Earth through which our technology and astronauts travel. Coronal holes are the source of a high-speed wind of solar particles that streams off the sun some three times faster than the slower wind elsewhere. 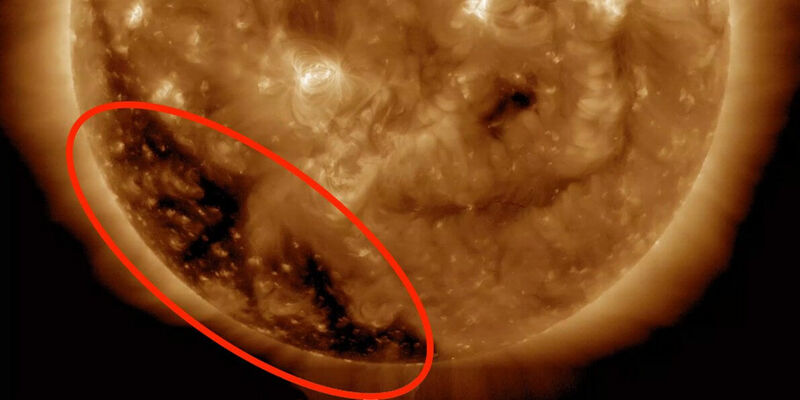 While it’s unclear what causes coronal holes, they correlate to areas on the sun where magnetic fields soar up and away, without looping back down to the surface, as they do elsewhere.